I normally make more of coconut ladoo which is another easy, no-cook recipe made with only 2 ingredients desiccated coconut and condensed milk, just melt in mouth ladoo and this coconut (nariyal) burfi my mom used to make for every Diwali other festivals, birthday etc. I made this after long time for a change from my usual coconut ladoo. 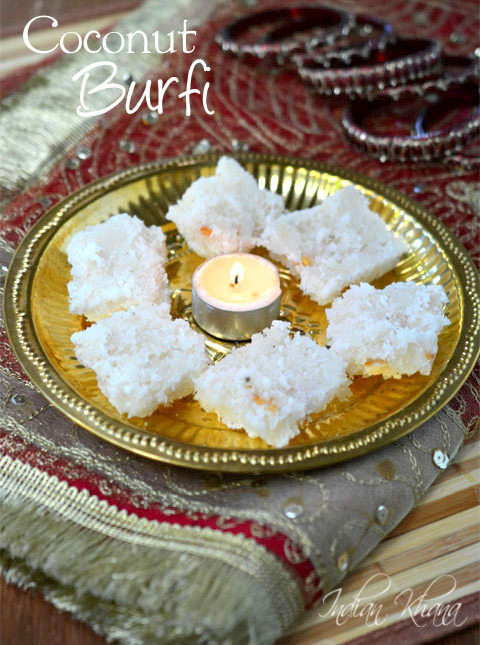 You can try this easy burfi for Karwa Chauth or Diwali. 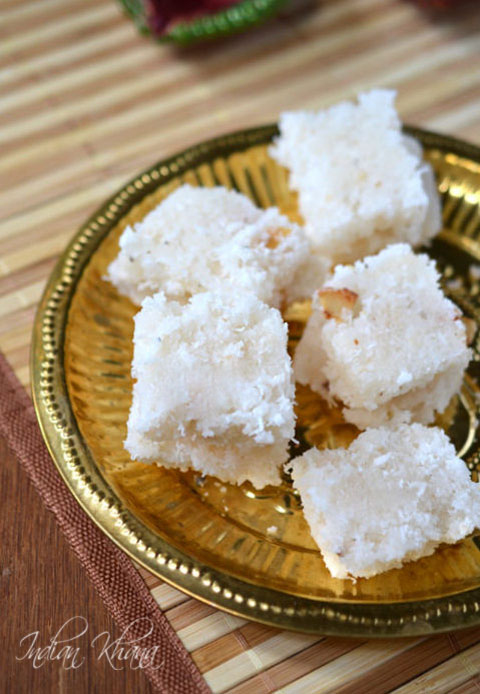 Made with fresh grated coconut and sugar this burfi is so easy and delicious. DH whom normally doesn't comment on anything was prasing this burfi on 1st bite itself and ask for more helping which is kind huge from someone doesn't compliment easily. If you look for easy sweet recipes which can be done in jiffy than this is for you specially during Diwali when we are busy with preparing so many other things. 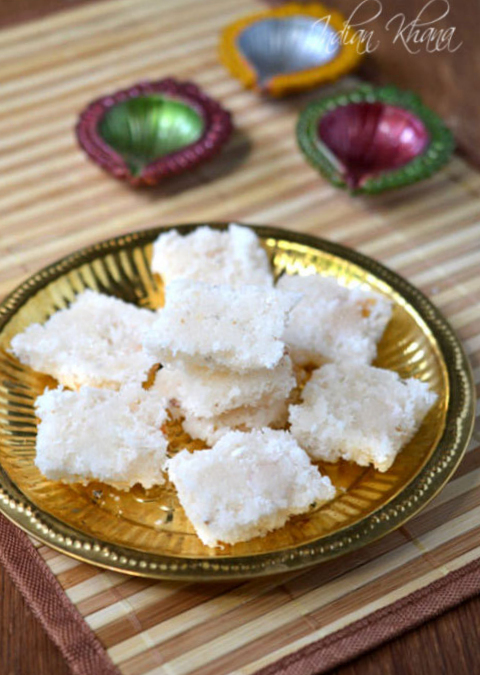 This coconut burfi stays good for almost a week so you can prepare in advance and keep it or you can store this burfi in fridge too. 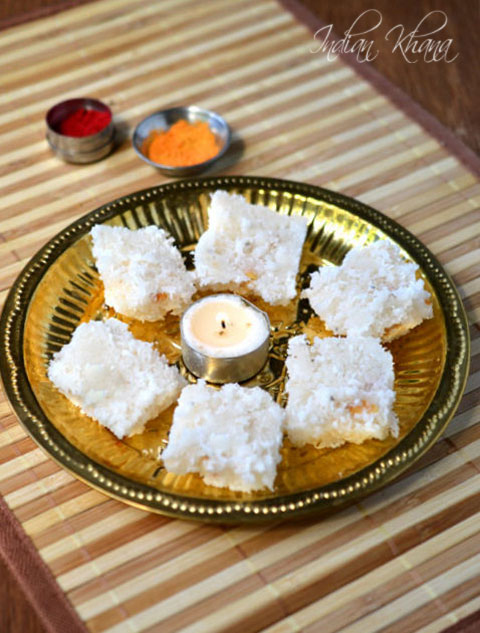 This coconut burfi are pure white since the brown part of coconut skin is not used, so you have to grate coconut taking care of that if not the burfi won't be in white color like this. This nariyal burfi are so soft to bite and juicy, you might feel it looks hard but it's not hard it's just the rustic looks which I like to have so I didn't smooth the burfi well while setting, if you wish to have smooth surface then level burfi with butter paper or aluminium foil, read the instruction I have mention same there too. 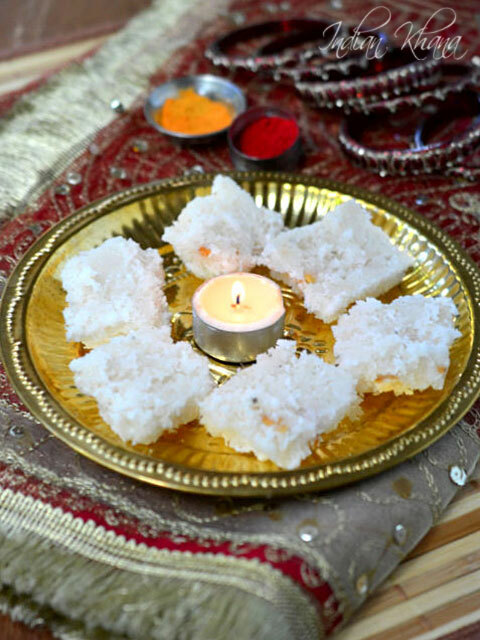 Easy, delicious Coconut (Nariyal) burfi with just 5 ingredients made in jiffy. Heat ghee in a pan or wok and fry cashewnuts until golden brown, keep aside. Grease a plate or tray and keep aside. In the same wok add grated coconut, sugar and mix well and cook in slow to medium flame. Keeping stiring the mixture until sugar melts and you can see water released from coconut. Do constant stir until coconut mixture starts to come together and leave side of pan. Press coconut with your spatula to check if any water remains, if you see water then keep cooking and stirring. Add caradamom/elachi powder, cashewnuts and mix well, you can see coconut mixture will start to change color now from pure white it will be light cream, off flame. Let the mixture cool a bit for 2-3 minutes and cut in desire shape when it's stil warm, allow to cool completely and gently with a knief remove the pieces, invert and allow to dry. Cooking time may vary due to coconut quality and how much moisture coconut has, so once you see there's no water and mixture starts to come together you can off flame. 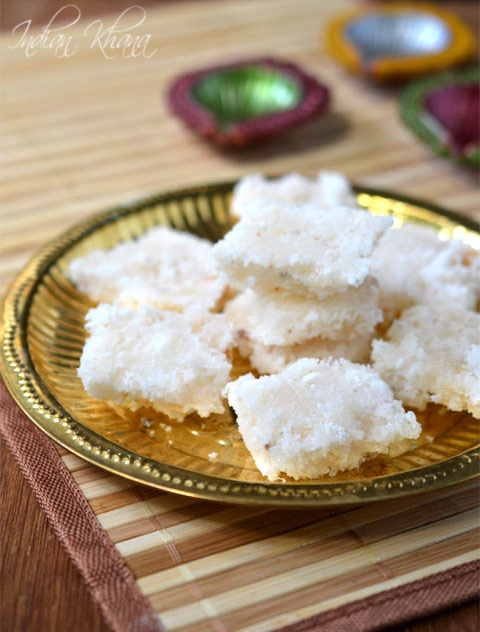 For pure white burfi, don't add coconut brown skin and grate coconut avoiding it. You should cook from start to end in slow to medium flame or medium flame. If you keep in high flame coconut will change color. To have smooth finish level mixture with butter paper, aluminium foil. I like this kind of rustic look so I didn't do that. You can add fried gram dal (pottu kadalai) instead of cashewnuts. For Vegan version, dry roast cashewnut pieces and grease tray with oil. This coconut burfi stays good for almost a week on room temperture. 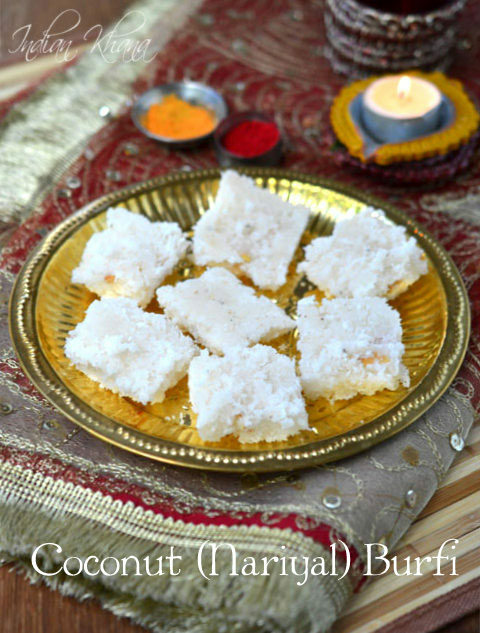 Easy, soft and delicious coconut burfi.